The overall print size is 16" x 20". Please add $20.00 for shipping, handling, & insurance. Overall framed size is 26.5" x 29.5". Comes with the following print caption on the white border below the image: Watchers in the Night - "For He will command His angels concerning you to guard you in all your ways. Psalm 91:11"
Comes in a gold frame with cream matting. The image size is 12" x 15". Please add $30.00 for shipping, handling, & insurance. This canvas deluxely framed in an ornate gold frame with black inlay. The overall framed size is 28" x 33". What is an angel? 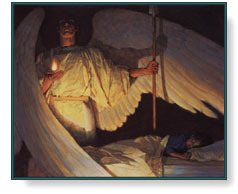 What does the Bible say about angels? Do We Have Guardian Angels? Find out the answers to these questions and more! Please read our Bible Teaching on Angels. The painting is entitled "Watchers in the Night" because it not only shows the powerful image of an angel providing covering and protection, but also reveals the presence of the Holy Spirit, which is represented by the flame above the angel's hand. Thomas said, "I hope you are reminded each time you look at this painting, that no matter what you are going through as God's child, there are angels under the Lord's command who are close by and ready to assist you." Watchers in the Night copyright© 1995 by Thomas Blackshear is prohibited from being copied. All applicable© laws apply and are reserved by artist Thomas Blackshear.